Eddie O’Sullivan believes the fawning reaction to Aki’s debut was an overcompensation, but was impressed nonetheless. 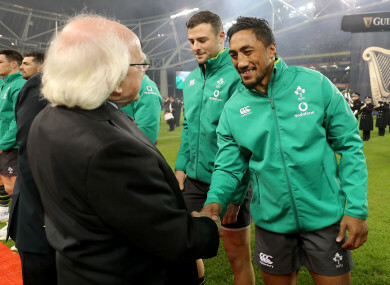 FORMER IRELAND HEAD coach Eddie O’Sullivan believes the vitriol which greeted Bundee Aki’s international selection and the lauding of his subsequent debut were both wildly over the top, and suggests Aki was ‘solid’ in Ireland’s destruction of the Springboks on Saturday. Speaking on The Rugby Show on The42, O’Sullivan voiced his bemusement at the furore which surrounded the Connacht centre’s Irish involvement, this in spite of his personal view that the residency rule should be extended to five years – and perhaps even entail a player officially becoming a citizen of their adopted country – as soon as possible. Through his inclusion in Joe Schmidt’s squad, Aki dominated the headlines in the week leading up to his Irish bow, and though O’Sullivan remains adamant that the Kiwi’s selection at least warrants debate, he’s bemused as to why that debate was for the most part squeezed into game week considering it has been on the cards since his arrival in Galway three years ago. He also pondered aloud why the discourse surrounding Aki became so prominent relative to Jared Payne and even CJ Stander’s adopting of the green jersey. “I just couldn’t get my head around it: ‘why are we having this debate now? What did Bundee Aki do differently than CJ Stander, Jared Payne?” O’Sullivan said. “I think it’s seven or eight players now have come through that system. Yeah, there was always someone that raised their head, but this turned into a national debate! “I thought the horse had left the stable a long time ago for that one. “And I thought that it was probably a bit unfair on him that it went to that stage, but I think it is a genuine debate. “It’s been addressed by World Rugby eventually, kicking and screaming, and they eventually pushed it [extended five-year residency rule] to 2020 again, which I think is kind of fudging it a wee bit. But I think the five-year rule is the way to go. Three years was a bit stupid. I think we all knew that. It’s going to be five now eventually. And I think, you know, go one step further if you want to, and say, ‘if you live here for five years and you want to play for Ireland, take out an Irish citizenship.’ And there’s nothing wrong with that: if you’re going to die for the jersey, what’s wrong with having a passport to go with it? O’Sullivan suggested that the relatively low-profile visit of the Springboks this time around may have contributed to the generation of Aki-related outrage within sections of the Irish media. In spite of his own feelings on the project player concept, he expressed some sympathy for Aki, too, whom he deemed to be merely playing the hand he had been dealt in 2014. “Maybe because there wasn’t much buzz around this game – the Springboks were here for the sixth time in 12 or 13 years, and we’ve beaten them four of the six times, and we beat them down in South Africa last year – there was kind of no mystique or mystery about the Springboks, and maybe we had nothing else to talk about. Maybe that was a good place to start. “But I thought it was a lot of hype about really nothing. And I felt bad for the player, because he was in the middle of a firestorm that had nothing to do with him; other people had done the same as he had. O’Sullivan wouldn’t go too far beyond ‘solid’, either, believing the reaction to Aki’s performance in some quarters amounted almost to an overcompensation for the rigmarole which preceded it. Nonetheless, O’Sullivan was left extremely impressed by what he perceived to be an unspectacular but fundamentally sound debut for the Connacht inside back. I think we were trying to roll back a lot of the nonsense that was talked about earlier in the week, and got a lot of airtime and column inches. I don’t think he had a barnstormer, I don’t think he lit it up. But to me, that’s okay – your first cap, to come in and tick all the boxes, don’t make any mistakes, get your job done. “I think that’s the way Garry Ringrose started when he got his first cap: nothing spectacular, made no mistakes, did all the right things. He had a very solid first cap. It wasn’t nine out of 10, but for your first cap, it doesn’t have to be nine out of 10. Six or seven out of 10 is good enough. O’Sullivan went on to discuss the dilemma facing Joe Schmidt in Ireland’s midfield, with at least four standout candidates putting their hands up to fill two slots. You can watch the full episode back here, or alternatively you can listen back in full below or on iTunes where it’s available in audio podcast format. Email “'I couldn't get my head around it: 'Why are we having this debate now? What did Aki do differently?''”. Feedback on “'I couldn't get my head around it: 'Why are we having this debate now? What did Aki do differently? ''”.